OLD PARKED CARS. 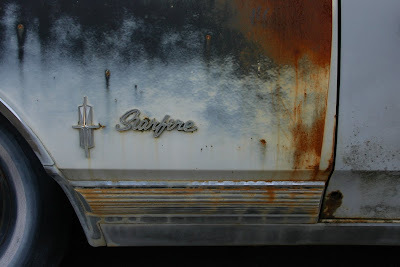 : 1965 Oldsmobile Starfire. So Sick! !! 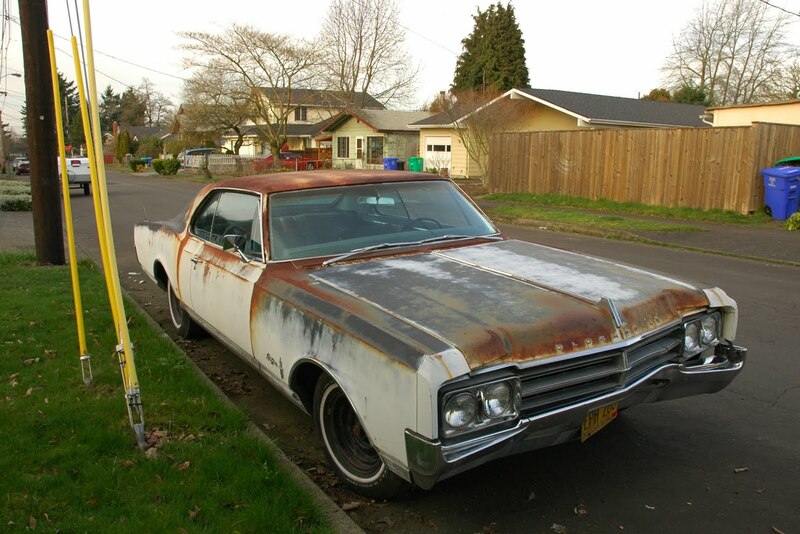 Those whitewalls give me the impression that the rust is of the cultivated sort, and in any case what a beautiful composition of primer, rust and old chrome. My god, it's perfect. Badass to the max, would drive as is. 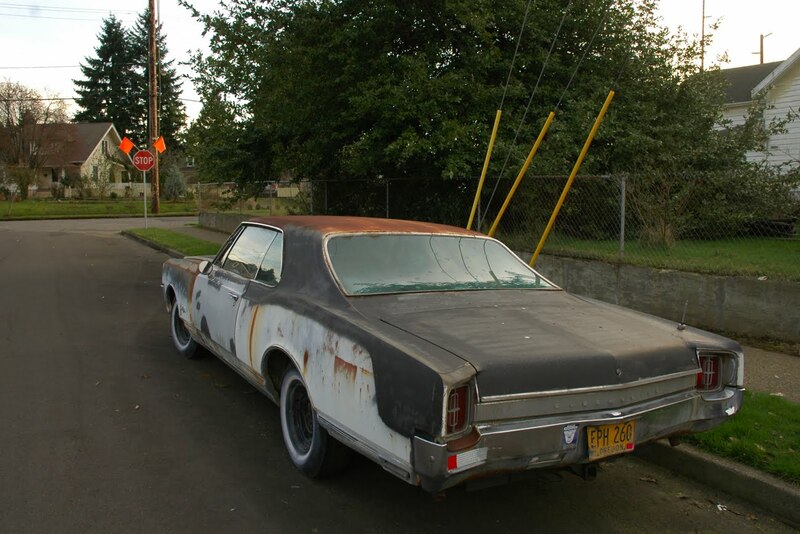 Nobody will screw with you driving an Olds this mean. The condition of it reminded me instantly of Billy Bob Thorton's character's dilapidated '69 Impala in Bad Santa. 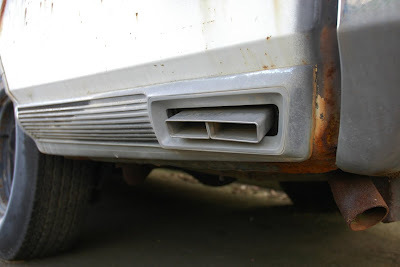 That exhaust is too cool! If only there was a way to ensure that this car would be allowed to remain in this wonderful, heavily-patinated condition. Given the potential value of this car if it is restored, it's probably unlikely that it'll remain as-is. Too bad, because this current condition is just wonderful. Of course, not everyone loves cars in this kind of shape. I disagree anon, I think this car will more than likely stay in this shape until rots away. 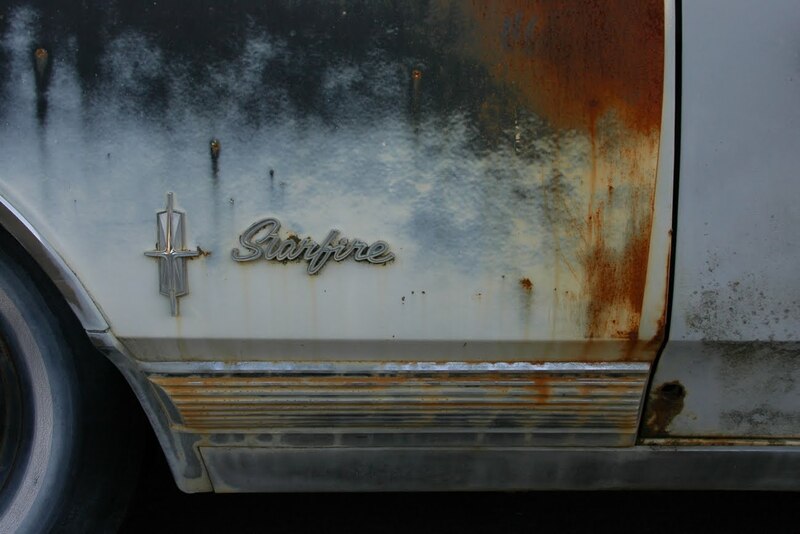 Nobody's restoring a Starfire; its one of those nameplates that was totally forgotten with the passage of time. 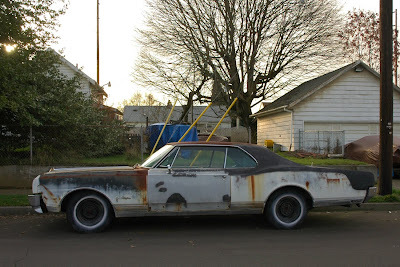 "...For the 1965 model year, all Oldsmobiles would receive new styling, and the Starfire Hardtop Sports Coupe would receive a modified version of the 1963-64 unique roofline with an inversely curved rear window. The Hardtop Sports Coupe body-style was again shared with the Jetstar I. Other 88 models adopted a Holiday Hardtop Coupe body-style that featured more of a fastback roof design, while the Ninety-Eight featured a more squared-off formal roof-line. A new version of the Rocket V8 engine was offered for the 1965 model year, this one measuring 425 cu in (7.0 l) displacement, still using a Rochester 4-barrel carburetor, and generating 375 hp (280 kW) at 4800 rpm. This was still the most powerful engine in the Oldsmobile lineup and used only in the Starfire and the Jetstar I. 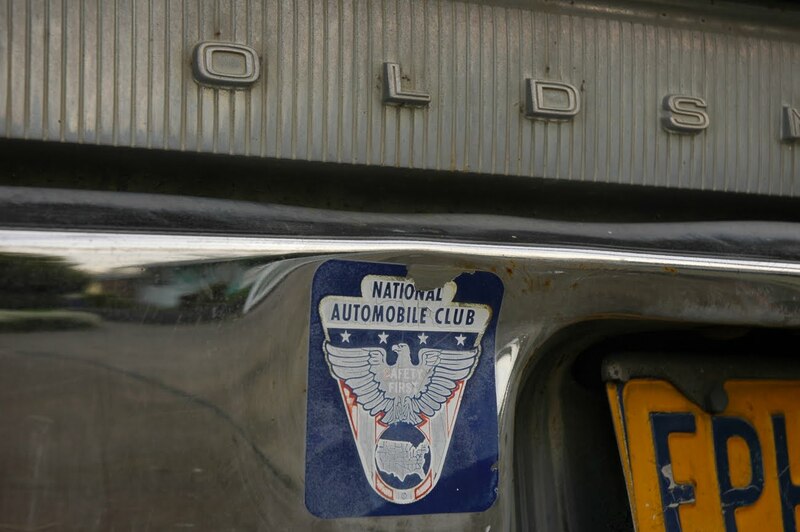 Also new for 1965 was the three-speed Turbo Hydra-Matic automatic transmission which replaced the previous fluid-coupling Hydra-Matic used by Oldsmobile since 1940. Added to the option list for the first time on Starfires and other B-body cars was a four-speed manual transmission with Hurst shifter that was rarely ordered. 1965 sales were 13,024 for the coupe and 2,236 for the convertible..."
These were top-of-the-line Olds. There are many in mint condition, but this one is probably a donor. I stumbled upon this post and was totally stunned. First of all, I can guarantee this car will be taken care of for years beyond expectation, and second of all... all the parts to restore it are in the basement, as this car in the photo is my grandfathers. We have been talking about what we need to do to preserve it. I was searching online for other views of this car, and found our own family car on here. What a trip. It's been in our famliy since it was new, it's seen better days and became a project lost in the complexity of life to the point where it is now.